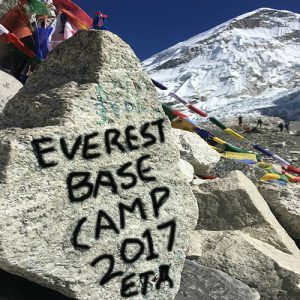 Everest base Camp is the worlds most well known trek made famous by the high altitude climbers who have succeeded in summiting Everest and perhaps even more famous by the climbers who have died trying. 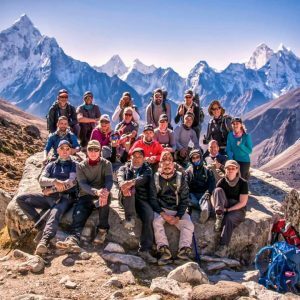 Everest Base Camp tours travel through the majestic Khumbu valley surrounded by snow capped peaks such as Tabocha, Island peak, Ama Dablam, Lhotse and of coarse MT Everest the worlds highest mountain. The Sherpa people in the Khumbu who inhabit this polarising valley are famous for their strength and resilience living and thriving in some of the worlds harshest conditions. We spend our time living in the tea houses that these families provide for the weary trekker. Click on our tour dates (tab at the top of the page) to see our small group set departure dates and all the information you require. All our Everest Base Camp treks include 2 nights accommodation before and after the trek in Kathmandu including site seeing with our in-house city guide to accompany you. 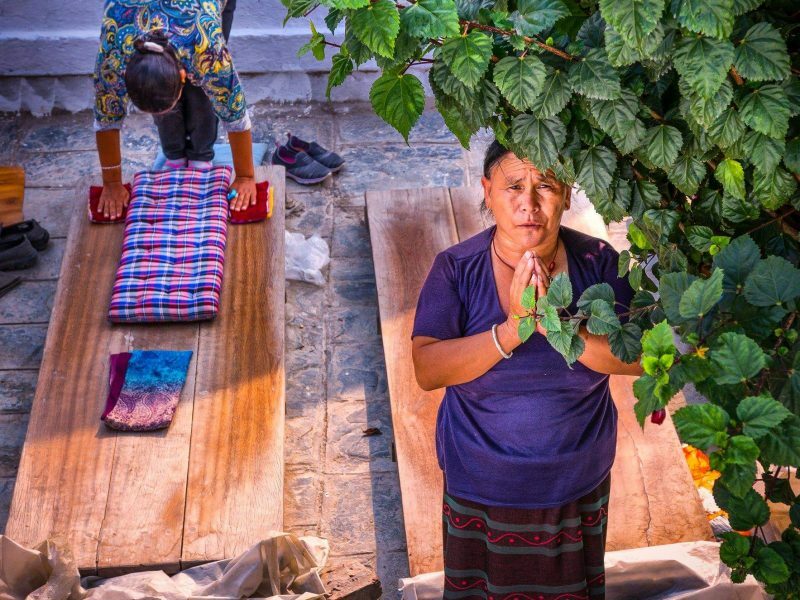 You visit Bodhanath, the Stupa of a million dewdrops and the Pashupatinath, Nepal’s most sacred Hindu temple dedicated to Shiva and Patan Museum that stores ancient Nepali artifacts, followed by a tour of Patan Durbar (palace) Square. All our tours include all of your food and water while trekking, this means as much food as you like with no set small portioned meals or limits on consumption. We pay for all fees, board (in superior tea houses) and have excellent english speaking guides and porters that are well looked after and happy to work for us. Escape Trekking Adventures operates under our sister business name of Escape Mountaineering. 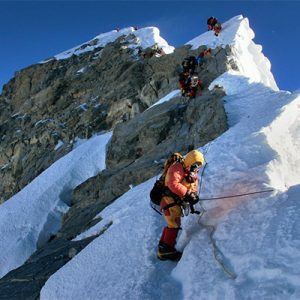 Escape Mountaineering is a small sized operator who pride ourselves in high quality service to our clients. We are an highly experienced in adventure travel and offer two types of Everest Base Camp tours. We offer a Standard Everest tour that travels from Lukla to Everest Base Camp and back to Lukla again following the same path. 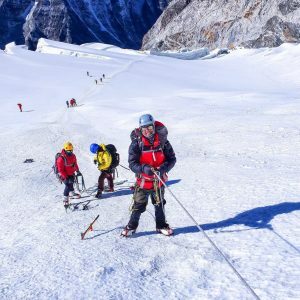 The alternate ultimate Everest tour we offer travels Lukla to Everest Base Camp as our Standard tour and instead of following the same path again we travel over Cho La (pass) where the most amazing glacier is placed. From here we can travel to Gokyo lakes and along the Gokyo valley or we than ascend Renjo La (pass) and trek down the isolated Thame valley. Height: 29,035 feet (8,848 meters). Most prominent mountain in the world. 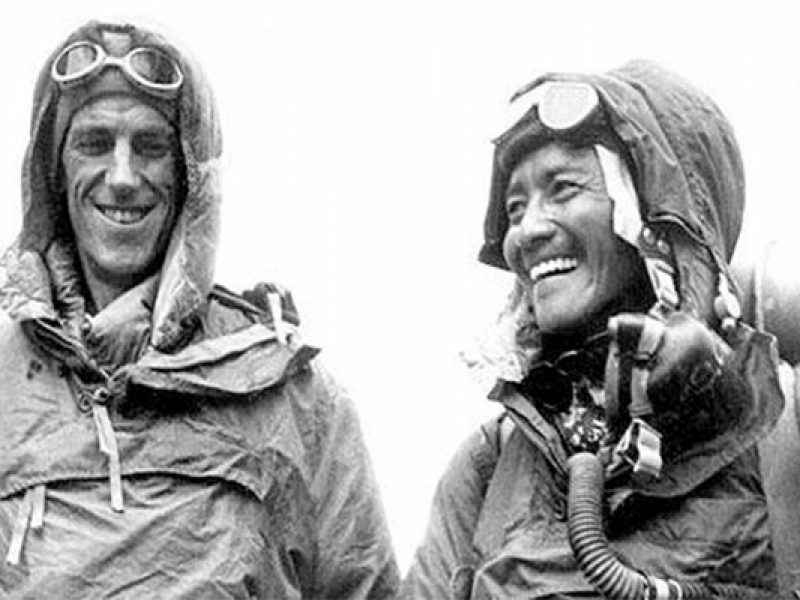 First successful Ascent: Sir Edmund Hillary (New Zealand) and Tenzing Norgay (Nepal) on May 29, 1953. Mount Everest is known as Chomolangma, meaning “Goddess Mother of Snows” in Tibet/China and Sagarmatha, meaning “Mother of the Universe” in Nepal. 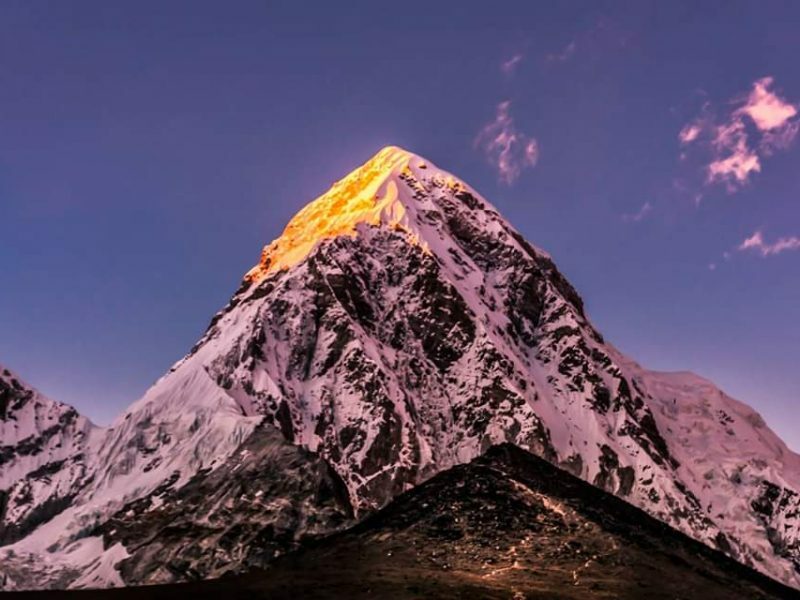 This mountain like many others is sacred to the local people in Tibet and Nepal. British surveyors named Mount Everest after George Everest (properly pronounced “I-ver-ist”). Everest actually despised mountaineering and was not alive when the mountain was named after him. Everest was a Surveyor General in India in the 19th century. Mount Everest is a huge pyramid formation with three faces and three major ridges on the north, south, and west ridges. Glaciers are responsible for the shape that carved out Mt Everest pyramid and today 5 major glaciers continue to shift Mount Everest. These glaciers are known as Kangshung Glacier on the east; Rongbuk Glacier on the north; East Rongbuk Glacier on the northeast; and Khumbu Glacier on the west and southwest. The Khumbu region is where our Everest Base Camp trek takes place. 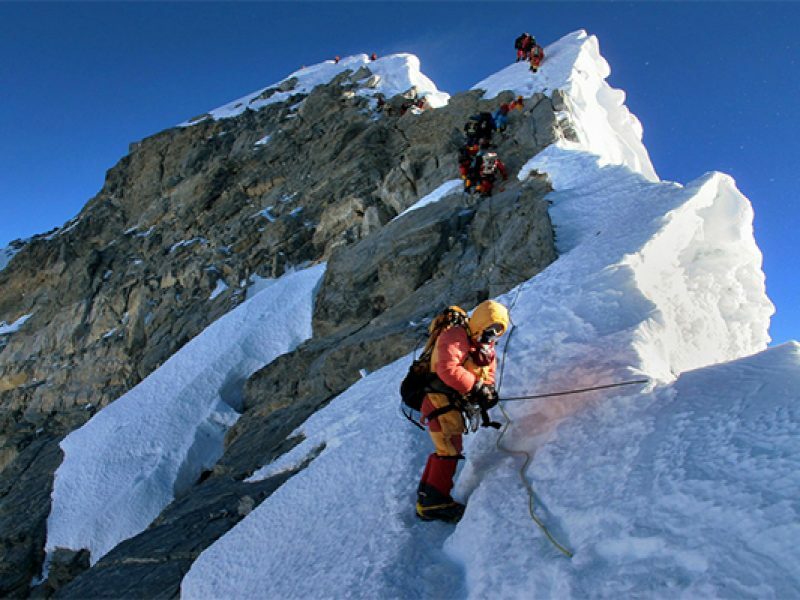 The South Nepalese side ascends the Southeast Ridge, called the South Col Route, and the North Tibetan side ascends the Northeast Ridge or known as the North Col Route. The Northeast ridge is often referred to as the most technical although the Hillary step on the South Col route is no easy feet. 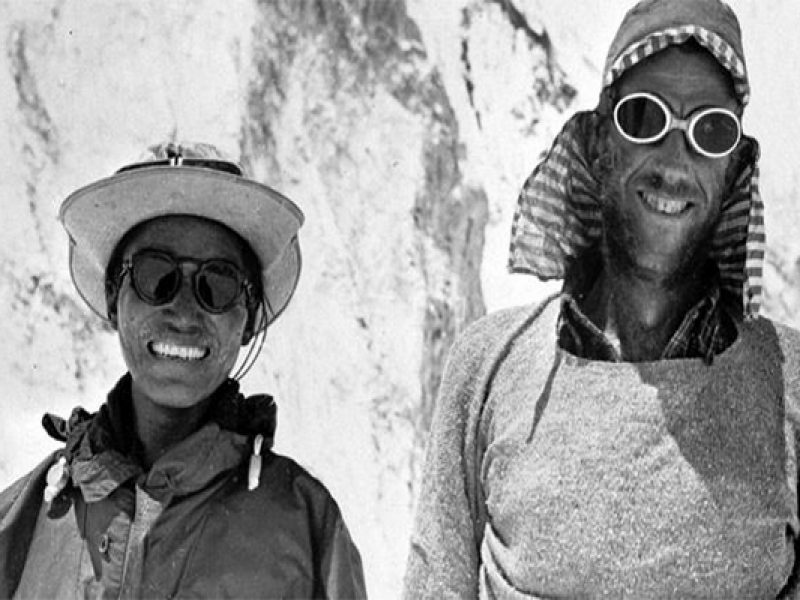 In 1978 Reinhold Messner and Peter Habeler were the first to climb Mount Everest without supplemental oxygen. In 1980 Reinhold Messner made the first solo summit ascent, which was also via a new route from the mountain’s north side. 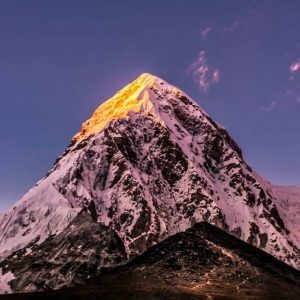 40 climbers was the most to reach the summit in a single day. This occurred May 10, 1993. 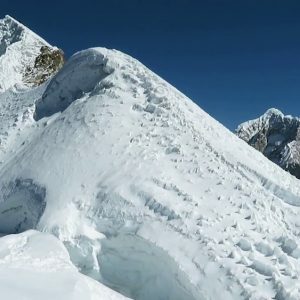 The single most tragic day on Mount Everest was April 18, 2014, when a massive avalanche killed 16 Sherpa guides in the Khumbu Icefall above Everest Base Camp in Nepal while they were fixing a route through the deadly icefall. 1993 was the safest year to summit Mount Everest with 129 climbers reaching the summit and only 8 climbers died. The Mount Everest movie is based on the events that occurred in 1996 when 98 climbers summitted and 15 died. That climbing season was documented by author Jon Krakauer who wrote “Into Thin Air”. 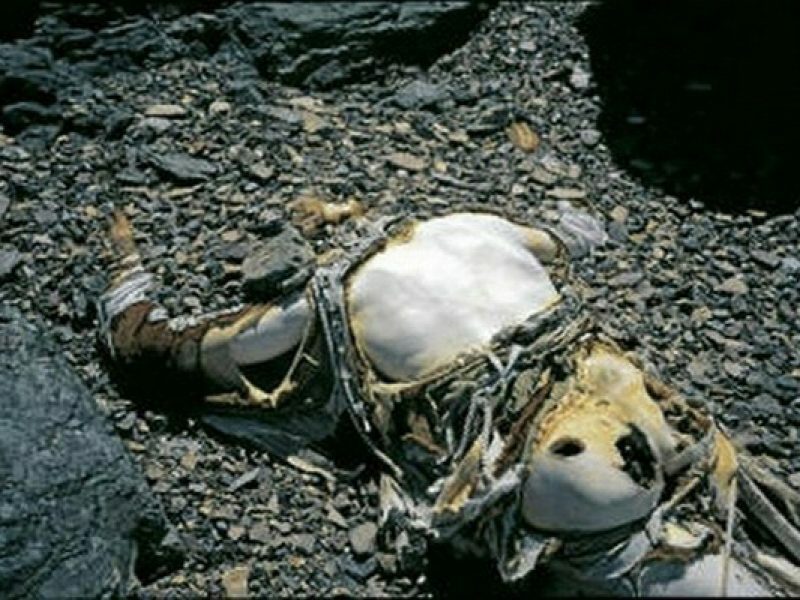 There is no official count of how many dead climbers still remain on the slopes of Mount Everest. 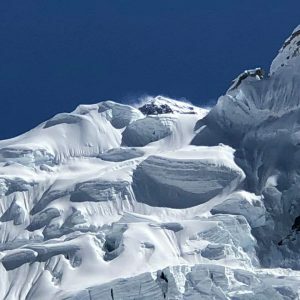 Some sources say there as many as 200 climbers on the mountain, with their bodies buried in crevasses, under avalanched snow, on mountain slopes after falls, and even alongside popular climbing routes. 12. Trek to Everest Base Camp and hike back to Gorakshep. (All meals) Gorakshep. Visit Everest Base Camp. 19. Trek to Khumjung. (All meals) Visit Swayambhunath and Bhaktapur. Day 01 - Arrive Kathmandu. You will be met on arrival at the Tribhuwan International Airport. Transfer to Hotel. Day Free. Enjoy welcome dinner. Briefing during dinner. Full day of sightseeing in Kathmandu. You will be accompanied by our in-house city guide. In the morning, visit Bodhanath, the Stupa of a Million dew drops, to watch monks and devotees circumambulate the largest stupa in the world. Then visit Pashupatinath, Nepal’s most sacred Hindu temple dedicated to Shiva, with its two-tiered golden roof and silver door. Drive to Patan for lunch in the garden of the Patan Museum Café. After lunch, visit the well-maintained Patan Museum storing ancient Nepali artifacts, followed by a tour of Patan Durbar Square. Drive back to Kathmandu. Day 12 - Gorakshep to Lobuche (4930m/16,174ft.). The trek to Kalapathar (5545m/18,195 ft.) is the final high-altitude climb of this trip, as a result of which you will perhaps achieve the highest reward for your perseverance. The trail ascends steeply to Kala-Pathar, but the view from here is one you are unlikely to forget. Return to Gorakshep and descend to Lobuche (4930m/16,174ft.). 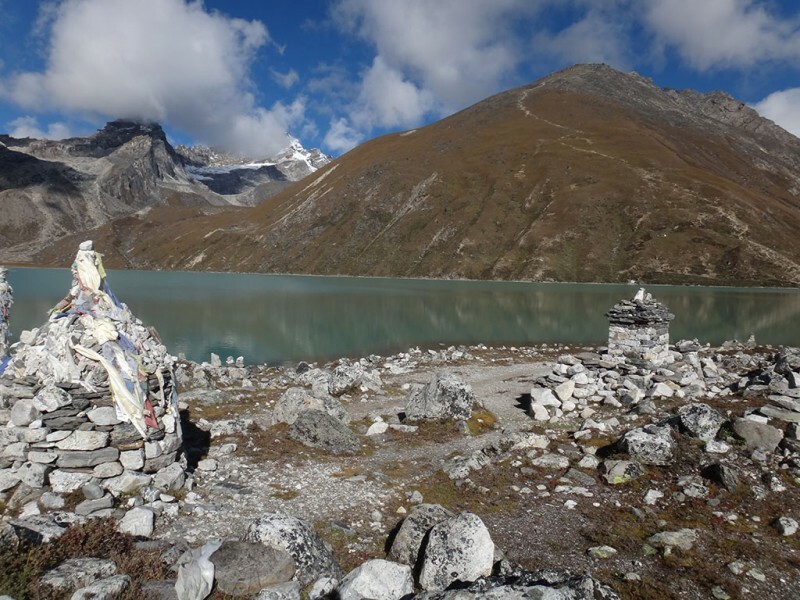 Day 13 – Lobuche to Pangboche (3958m/12,985ft.). Today we follow the decent further down below 4000m. Once below 4000m your body begins to feel stronger and lungs appear to take on more oxygen. Descend sharply to the Dudh Koshi river and then ascend to Mong danda. Follow the slopes of Khumbila towards the hidden valley of Khumjung. 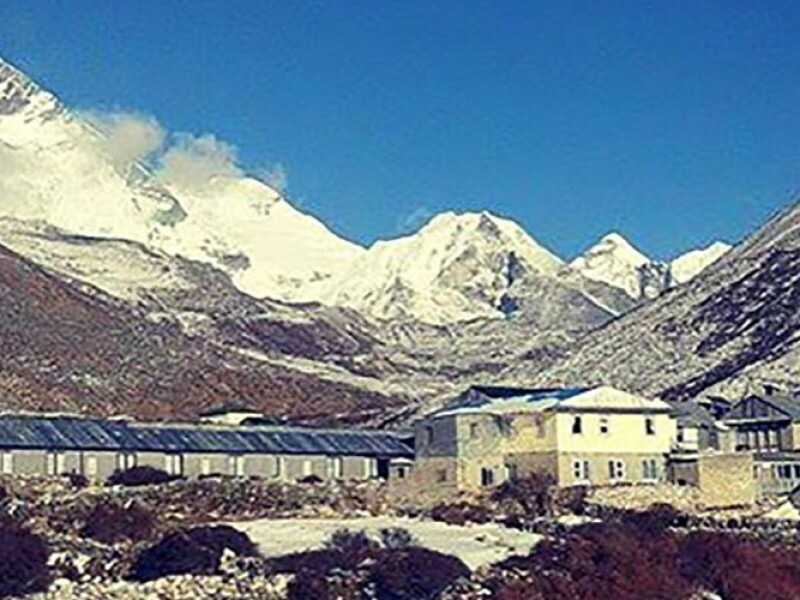 At Khumjung, visit the Khunde Hospital and then the Khumjung School – both projects of the Himalayan Foundation. Descend to Monjo. Descend steeply from Khumjung to Namche from where you rejoin the trail you came up on. Last day of trekking in the Everest region. The Everest Base Camp trek ends in Lukla. Fly Lukla to Kathmandu. Day free in Kathmandu. Full day of sightseeing in Kathmandu: visit Swayambhunath, the monkey temple. Then drive to Bhaktapur, the city of Devotees, for lunch and a tour of the royal palace square. Hike up Kalapathar (5,545m/18,195 ft.) for views of Everest. This 1,100 ft. steep ascent is challenging. Previous clients’ times for this climb have ranged from two to five hours – one way. At a slow and steady pace we move into position to see the all mighty beast, weather permitting the summit of Kalapathar serves as one of the best face-to-face view-point for the southern massif of Mt. Everest. Escape Trekking Adventures T-shirt (quick dry). 4 nights twin sharing hotel accommodation at Hotel Tibet (3 star) in Kathmandu (or similar). History of the Nepal region. Personal expenses while on the trek and meals in Kathmandu. Our optional extras for our Everest Base Camp tours include a Sleeping Bag, Insulated Jacket and single supplement for the entire tour. 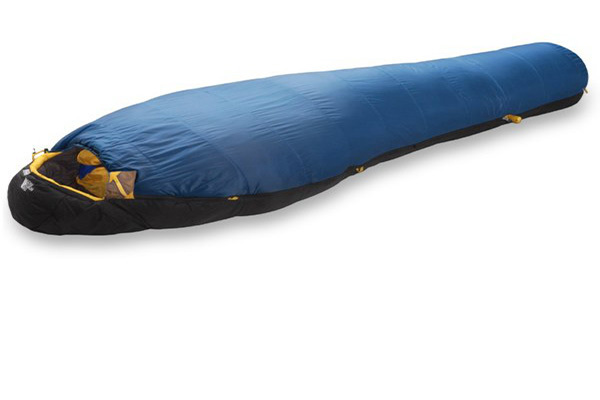 Our Sleeping bags are insulated with water-repellent 800-fill Pro Down and constructed to accommodate wider clients and incorporate a roomier cut with quality zippers to make it easier to get in and out. 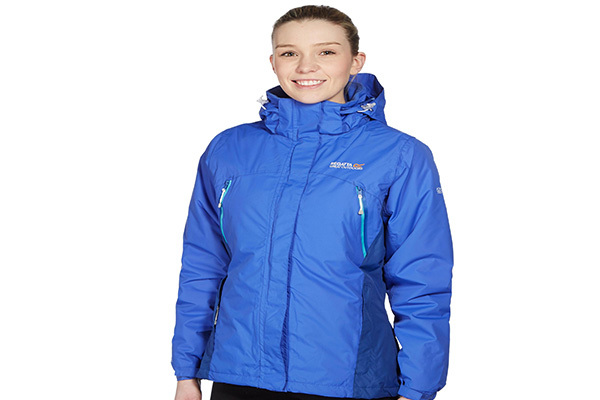 Our Insulated jackets come in a range of sizes to suit every bodies individual needs. These jackets are warm and toasty essential to a successful Everest Base Camp trek. If you would like to have your own privacy in while trekking and while staying in the hotel in Kathmandu this luxury comes at a price of $450 for the entire trip. You can select this option while booking your tour or after the booking is made contact our office to arrange this optional extra. Included in this package is bag portage carried by one of our local team members. All that you will be required to carry is a daypack of around 40L in capacity. You are required to purchase a duffel bag to put the bulk of your gear in and this should be no smaller than 120L. The below is a list of items you require and what you would need to carry in our daypacks. Upper body clothing – three layers. Should be polypropylene or pile, not cotton. Essential toiletries – toothbrush, toothpaste, soap, wet wipes, toilet paper, hand sanitizer etc. Any medicine that is required in an emergency. i.e. Asthma Inhaler, sugar for diabetics etc. This is what I personally wear on the trek. You will leave a bag in the hotel lock up in Kathmandu that is returned back to you when you arrive back from Luklu. You can leave additional gear not required and clean gear for your return in this bag. I recommend that you bring with you at least $350 AUD for snacks, beverages souvenirs and the old meal not included on the itinerary. You will be able to access ATM’s in Kathmandu and Lukla and Namche (sometimes unreliable) if you require additional funds. Please place a lock on the bag you are leaving behind. Australian Passport holders who will be trekking in the Nepal region are required to obtain a Tourist Visa to visit Nepal. Tourist visas to Nepal vary in costs. See below table for costing’s for Australian citizens. Alternatively if you are an overseas resident outside Australia please contact your local consulate to confirm they require the same inclusions. Visa is available on arrival however the lines and queues can be long and take hours to process, we recommend that you should avoid visa on arrival. Visa Prices as of the 16th April 2016, please check the current pricing before submitting your visa application. Our website information is to be used as a guide as visa applications and processes can change without warning. Trekking to Everest Base Camp is not a walk in the park! It is an amazing challenging experience, and the amount of training and preparation you do beforehand can determine the amount of enjoyment you have on the trek. We recommend that you put in at least 3 months training before you trek. If you are in good physical fitness, your preparation time may be less. 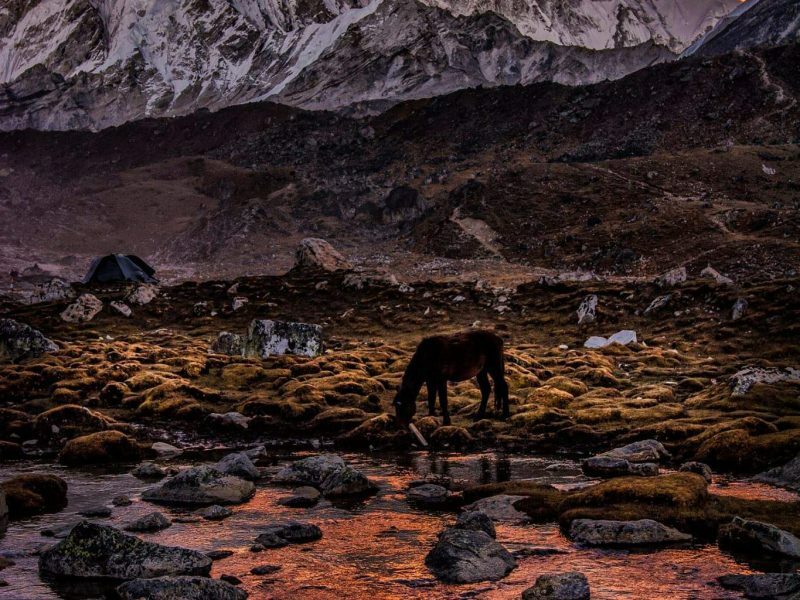 For those of you new to trekking, you have a wonderful experience in store as you discover Nepal.Trekking is walking, generally on good formed to semi formed trails, usually with ascents and descents every day (sometimes 3,000 feet/900 meters a day), carrying only a day pack, Our day starts early – often the bulk of the day’s distance is covered before lunch. Lunch is a hot meal served on the trail in lodges owned by locals. A shorter afternoon hike brings you to camp or your lodge with time to rest, have a cup of tea, take pictures, make journal notes, and wash up before dinner. Nepal is not like home. It is exotic, it is wonderful, but it is also different. Remarkable elevation changes, different customs and language, new foods, and the many other mysteries and wonders of travel in Nepal are all conditions you must be physically and mentally prepared for. 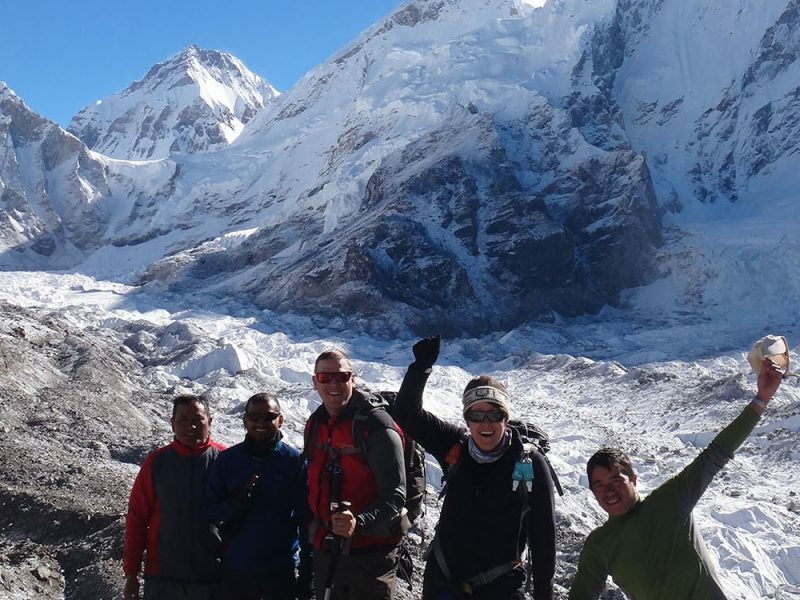 Training for Everest base Camp is unlike any other activity you undertake. For example in Australia you will be unable to train outdoors at altitude. The type of training program you need to undertake will vary on your pre existing fitness levels, strength and minor injuries or impairments you may already have. To avoid residual fatigue ensure you have at least one rest day ideally after your hardest session of training for the week. Vary the method of training over the coarse of the 12 weeks from bike riding to interval training and a little running, however 60% of your cardio workout should be bush walking with a pack on. The differening categories will be little to no pre-existing fitness level will require 16-20 weeks of preparation in some cases if you are over weight it may require more then 20 weeks to be ready). Limited fitness but can climb a 3 story staircase in a brisk manner resulting in a little shortness of breath and not be bent over huffing and puffing at the top of the stairs should see you needing 12-16 weeks of training to prepare. Some fitness level, which includes mostly cardio training. This type of person could complete 3 x 1 hour walks per week and do 10 push ups along with 20 sit-ups. This type of persons would also engage in physical activity on a few occasions per week i.e. bike riding, running, swimming, ball sports or sport that involves a good level of cardiovascular strength. They could prepare in 10-12 weeks. 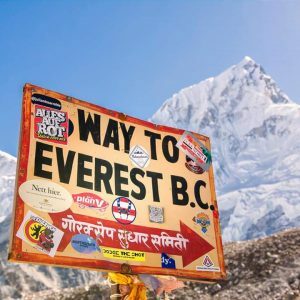 Don’t be scared or put off on taking on a high altitude challenge like Everest Base Camp just remember everyday normal Aussie’s (and other nationalities for that matter) travel to Nepal and walk one of the many high altitude treks. If using a slow ascent method and you listen to your body not ignoring the early warning signs of altitude sickness (AMS) you can make this a successful journey. The early onset symptoms of mild head ache can be common and may just require you to slow your pace a little and take an extra hour to reach the end of the day or perhaps stop ascending for a day and let your body acclimatise to the altitude. When training for altitude treks I like to increase my cardio capacity by focusing on interval training for periods of 3 week rotations between that and hiking. The increased cardio capacity can assist you when trekking over 3500m. 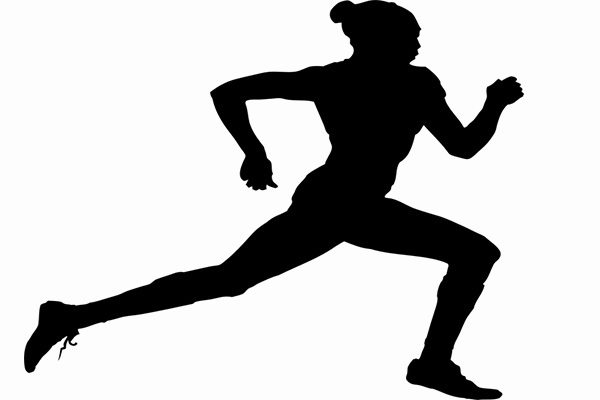 Begin interval training with 4 sessions of 25 minutes. The high intensity period should begin at 20 seconds with 40 seconds rest for week one and 25 seconds of high intensity with 35 seconds rest for week 2, followed by 30 seconds of high intensity with 30 seconds rest for week 3. Begin your walking with 3 x 30 minute sessions on mild terrain with a camel Bak (water bladder in a bag) and one session of interval training with 30 seconds of high intensity with 30 seconds rest each week. For week 5 and 6 increase the length of time for hiking by 30 minutes each week and pack weight by a kilogram each week also. Back to interval training for 3 sessions of 40 minutes beginning with 30 seconds of high intensity with 30 seconds rest. Weeks 8-9 try to increase the 35 seconds of high intensity with 25 seconds rest. Include one hike each week for a 2 hour period for week 8 increasing this by 15 minutes and week 9 another 15 minutes taking you to 2&1/2 hour walks. Your pack weight should increase by 1/2 kilogram each week also. This rotation include a half/half mix of intervals and hiking. Increase the hiking time by 30 minutes each week in this rotation and pack weight should increase by 1/2 kilogram each week. 3-4 x 3 hour hikes up and down hilly terrain with an increase pack weight of 1/2 kilogram and one interval training session of 40 minutes beginning with 30 seconds of high intensity with 30 seconds rest. 3-4 x 3 & 1/2 hour hikes up and down hilly terrain with an increase pack weight of 1/2 kilogram and one interval training session of 40 minutes beginning with 30 seconds of high intensity with 30 seconds rest. 3-4 x 4 hour hikes up and down hilly terrain with an increase pack weight of 1/2 kilogram and one interval training session of 40 minutes beginning with 30 seconds of high intensity with 30 seconds rest. Rest up this week with only 2 walks on flat terrain for a period of 30 minutes. In addition to the above guidelines you should consult your personal trainer and work on some strength training mainly core work. Manju trained under the tutelage of Peter Owens and has worked for Peter Owen’s Asian Treks since 1991. Starting out as a porter, Manju slowly worked up to become a cook and then a Sirdar (senior guide). 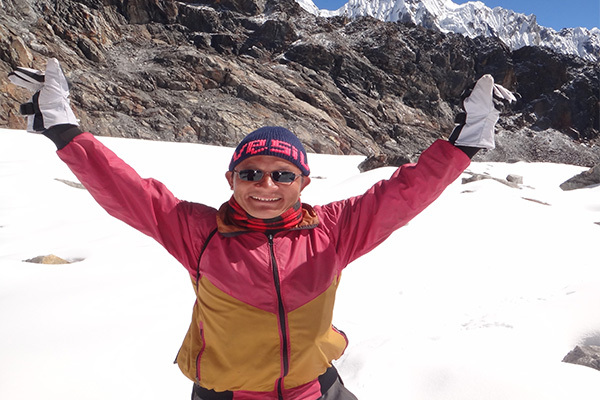 Manju has guided all major treks in Nepal and has also trekked in India (Ladakh and Sikkim), and Tibet. Manju has a kind and attentive nature to our groups and is very experienced at high altitude. His ability to access the clients well being and make correct informed decisions on the situation sets him above all guides we have working in Nepal. With excellent english skills Manju is a great communicator and friend. 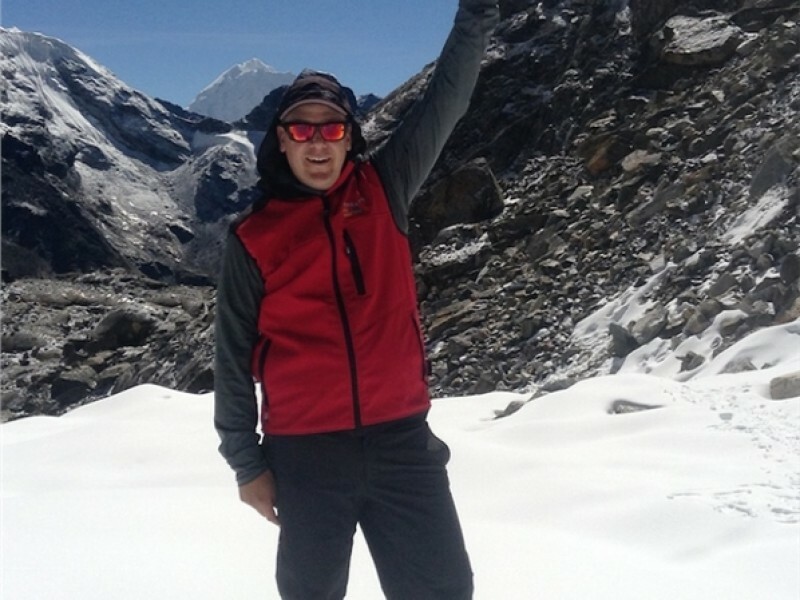 Trained in first aid and altitude sickness diagnosis and prevention makes him a great guide to carry out our tours. Manju attended the 5 day organized by Kathmandu Environmental Education Project (KEEP) and will be required to attend refresher courses every year. Buddhi Rai has a cheerful and happy attitude makes him a popular guide among our trekking friends. Buddhi has traveled extensively in Nepal from east to west, as well as in Tibet and Pakistan. He probably has the record of accomplishing the most trips to Everest BC among many guides in the Khumbu. 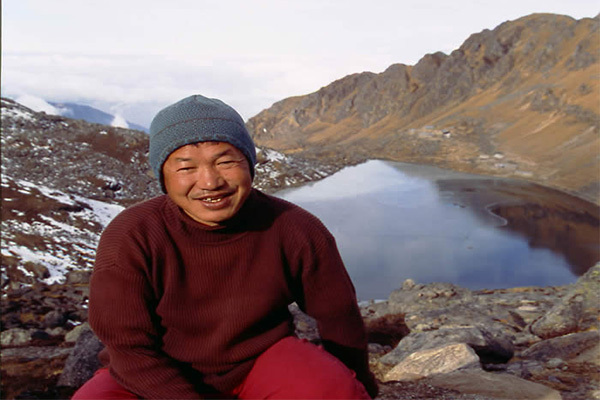 Buddhi has been guiding for over 30 years. Prior to guiding, he was also an accomplished trekking cook, and his latent culinary skills may show while on a camping trek. Buddhi attended the 5 day organized by Kathmandu Environmental Education Project (KEEP) and will be required to attend refresher courses every year. 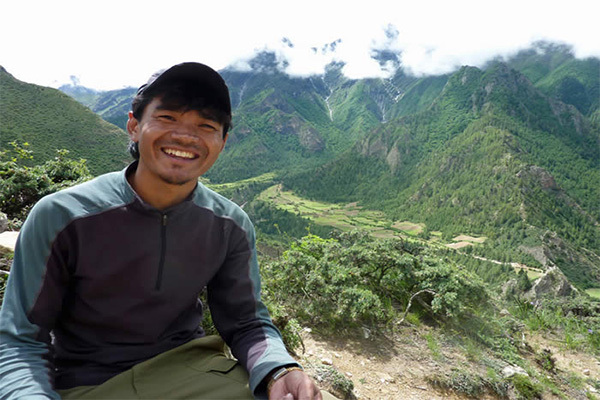 Sune Gurung is another promising Junior Guide for Escape Trekking Adventures. Sune’s pleasant demeanor is an asset on any trip. Sune started out as a porter and is now a junior guide. He too is honing his guiding skills working as an assistant guide to our senior guides on many trips every year and has been attending English classes. 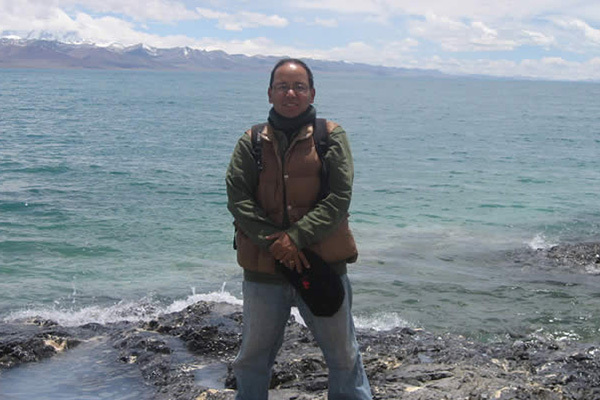 Binaya Rana is ETA’s leading guide for city tours and special interest groups in Nepal and Tibet. As a certified Kathmandu Tour Guide, Binaya provides you with an insightful look into the past history and current issues of Kathmandu Valley. As a Buddhist scholar, practitioner, and teacher (Binaya taught Buddhism at the University of Connecticut), Binaya is also an excellent resource for spiritual and special interest groups to Nepal and Tibet. Binaya plans to pursue a doctorate in Buddhism in 2010. 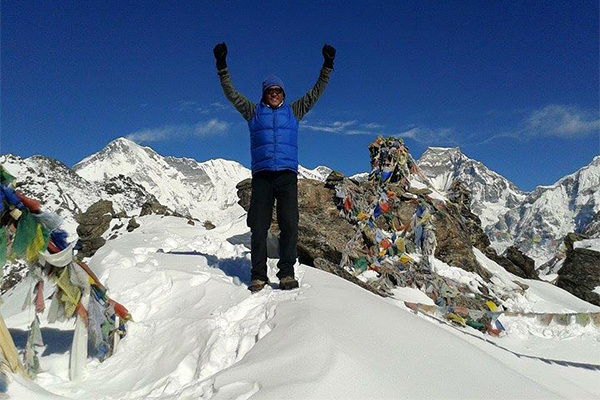 So you have decided to choose Escape Trekking Adventures to facilitate your Everest Base Camp adventure, Great choice! 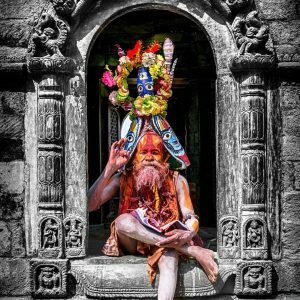 What are the processes to book, pay and complete your Nepal tour? Book online via our website selecting the tour date that you wish to join and filling out our booking form as part of the shopping cart. Alternately you can call or email us to make your booking. Pay a $700 deposit (non-refundable) in to our account either online through our secure website payment system, deposit money in to our bank account (contact us for details) or call us and make a credit card payment over the phone. Escape Trekking Adventures will send out our destination information packs containing a 3 month training plan, destination information, forms (that are required to return to us), a doctors examination (to alert you and ETA of any pre-existing conditions that may effect your trek, visa forms including a supporting letter that the embassy requires, gear list and a gear discount voucher. 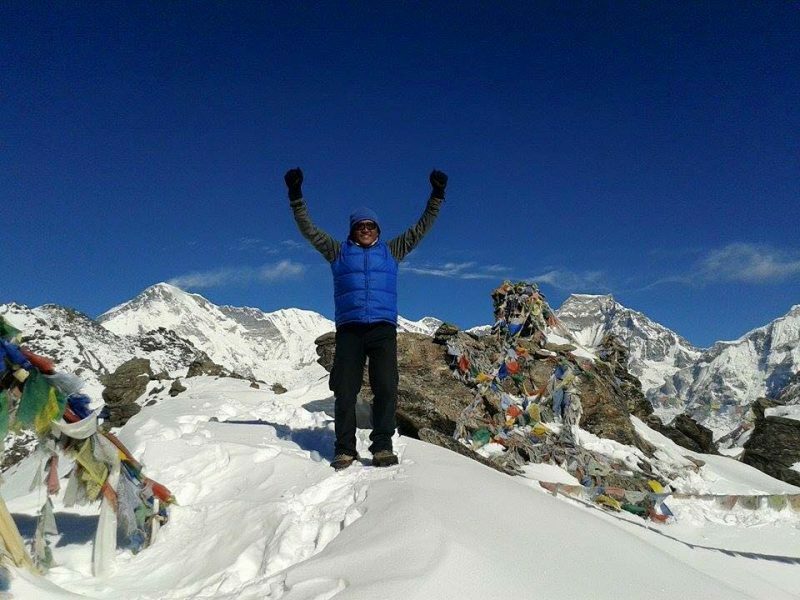 Begin training for your Everest Base Camp tour as soon as possible to ensure you get the most out of your tour. From our gear lists that we provide purchase your trek gear. Get a medical check to ensure that there is no under lying health issues you and I don’t know about. Send you passport and visa application forms (enclosed in our packs) to the Nepalese consulate to obtain your visa. Fill out our destination forms and return to us no later than 60 days prior to your adventure beginning. Pay your balance 60 days prior to your adventure beginning. (let us know if you need a little more time we are not unreasonable if you have paid for a majority of your tour already). Receive pre departure emails from us with advice and information. Please read carefully these terms and conditions of this contract. In completing and submitting the Booking Form, you agree to be bound by these conditions which constitute the agreement between Escape Trekking Adventures ABN 71 827 095 874 and you. No purported variation of these conditions will be effective unless in writing and signed by a person so authorised by Escape Trekking Adventures. In these terms and conditions reference to “Escape Trekking Adventures representatives” means tour leaders and staff of Escape Trekking Adventures and its officers, employees, agents, licensees, guides and other third parties and representatives and the land management authorities in each country in which the tour is conducted, or any of them. How to Book. To reserve your place on one of the tours, you should complete the Booking Form and send it, along with a non-refundable deposit of $700 per person per trip to the nearest Escape Trekking Adventures office, or to your travel agent. Some trips require a non-refundable additional deposit or instant payment for a permit. In these instances refer to the individual trip notes for details. Travel Insurance. Personal travel insurance is not included in the tour price. Adequate and valid travel insurance is compulsory for all of Escape Trekking Adventures travelers. Your travel insurance must cover accidents, injury, illness and death medical expenses, including any related to pre-existing medical conditions, emergency repatriation (including helicopter rescue and air ambulance where applicable) and personal liability. We also suggests it covers cancelation, curtailment and loss of luggage and personal effects. You must provide proof of insurance to Escape Trekking Adventures. Escape Trekking Adventures reserves the right to cancel or suspend your participation on a trip or in certain activities that comprise part of a trip, at any time, including after the commencement of your tour, with no right of refund, if you are unable to provide proof of insurance when requested. Evacuation, Withdrawal From Tour. In the unlikely event of an evacuation or withdrawal from any tour, Escape Trekking Adventures reserves the right to pass on costs incurred, including transport, logistical support and communications. Clients should submit these costs to their travel insurance company as part of their claim. Clients who have to withdraw from the trek for medical or any other reason, will be required to return to Australia on the first available International flight. They will also be required to meet any personal accommodation, transport and medical expenses incurred during their time away from their nominal home and claim these against their personal travel insurance policy. Escape Trekking will Adventures not accept liability for any of these expenses. Personal Images. You agree that Escape Trekking Adventures may use images of you taken during the tour without recourse to you and without compensation to you, for publicity and promotion purposes only through whatever medium it chooses. If you do not want agree to Escape Trekking Adventures using these images, you must inform Escape Trekking Adventures in writing prior to the departure of the trip. Personal Information. In order to be able to supply our adventure service to you Escape Trekking Adventures will need to collect certain personal information from you. The information may be disclosed to, or collected on our behalf by our service providers to enable the services to be provided, but will not be used by them for any other purpose without your express permission. 6.Health & Fitness Requirements. You must be in good health and physical condition and are strongly advised to follow our pre departure fitness training recommendations, where necessary. For many of our tours you will be required to submit a medical questionnaire completed by you or your doctor as proof that you are fit enough to participate in the tour. If you have booked a tour graded 1-5 the only time that a medical questionnaire will be required by your doctor is where you have a pre existing medical condition, are over 65 years of age. This will be sent to you upon booking and you will be required to return the form completed and signed by your doctor 70 days prior to departure. If you have booked for a tour graded 6-10 you will be sent a medical form upon booking and you will be required to have your doctor complete and sign your medical questionnaire and return to us 60 days prior to departure. If you suffer from severe muscular, chest heart or bronchial disorders, or if you are a severe asthmatic, or have high blood pressure, you are strongly advised against participating. Tours take place in remote areas where there is little or no access to normal medical services or hospital facilities for serious problems. Evacuation, where necessary, can be prolonged, difficult and expensive. Medical and evacuation expenses will be your responsibility. 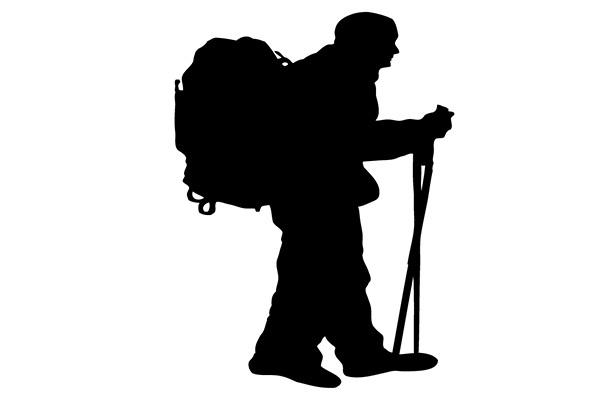 While we do not discriminate by age, due to the extreme nature of our mountaineering trips we strongly discourage participants over 60 years of age. Escape Trekking Adventures reserves the right in its absolute discretion to refuse a participant. 7. Medical Disclosure. It is your responsibility and you must advise Escape Trekking Adventures of any pre-existing medical condition and/or disability that might reasonably be expected to increase the risk of you requiring medical attention while on our tours. Escape Trekking Adventures or our suppliers may require additional medical assessment by a medical practitioner. Escape Trekking Adventures reserves the right, at its reasonable discretion, to cancel your booking and refund the money paid by you, less any unrecoverable costs. Escape Trekking Adventures also reserves the right to cancel your participation in a trip at any time, including after the commencement of your trip, with no right of refund if your medical condition and/or disability could be reasonably expected to affect the normal conduct of the trip and the enjoyment of other trip members. Escape Trekking Adventures are permitted to disclose medical information to our consultant doctor. Escape Trekking Adventures consultant doctor may exclude you from a tour if he/she deems it necessary. You acknowledge that the obligation to disclose under this condition continues from the time of booking the tour through to departure and extends for the duration of the tour. You have taken the necessary precautions to immunise/vaccinate for the destination you are travelling to. If you fail to comply with the duty of disclosure in this condition and if Escape Trekking Adventures would not have permitted you to undertake the tour, or continue participation of the tour, had you made full disclosure under this condition, Escape Trekking Adventures will not be liable, except to the minimum extent. 8. Tour Leaders. Escape Trekking Adventures reserves the right to cancel any tour prior to departure. In this condition, ‘tour leader’ includes both the nominated tour leader and any other nominated person given at any time the task of leading or supervising any aspect of the tour. Escape Trekking Adventures tour leaders take their responsibilities seriously and if for any reason a tour leader believes, in his or her absolute discretion, that you should not participate in the tour, before your departure, even if you pass your medical, he/she may exclude you from the tour. In this event, but subject to condition 6, you will be offered the option of taking another tour considered suitable for you or a full refund. If for any reason during a tour the tour leader considers you should not participate further due to you committing an illegal act, or in the opinion of the nominated tour leader, your behavior is causing or is likely to cause danger, distress or annoyance to others, or your fitness or health is inadequate, he or she may direct you not to continue and you must follow the nominated tour leader’s instructions. In this case you will not be entitled to any refund. Travel insurance may compensate you depending on the circumstances. Escape Trekking Adventures reserves the right to change, at any time, the tour leader of any tour. If that happens, Escape Trekking Adventures will try to ensure that the alternative tour leader has expertise commensurate with that of the tour leader. Any such change by Escape Trekking Adventures will not give rise to any right on your part to cancel the tour or claim any expenses, loss or damage which may be suffered. 9. Cancelation by Escape Trekking Adventures. Escape Trekking Adventures reserves the right to cancel a departure and will advise you of such cancelations no later than 30 days before the tour departure date. If due to ‘Force Majeure’ or government travel advice, Escape Trekking Adventures reserves the right to cancel a departure at any time. With any form of cancelation, Escape Trekking Adventures will do it’s best to offer you alternative arrangements if available, and if the price of your alternative adventure is of lower value than the original booking we will refund the difference to you. If you do not accept alternative arrangements we will refund all payments you have made to Escape Trekking Adventures, (in case of ‘Force Majeure’ or government travel advice refunds will be less any unrecoverable costs). Escape Trekking Adventures will not be liable for any additional costs incurred by you. Escape Trekking Adventures will not be liable for any delay in, change to or cancelation of trips due to ‘Force Majeure’. ‘Force Majeure’ definition means a circumstance beyond the reasonable control of Escape Trekking Adventures and includes, but is not limited to, war or threat of war, riot, civil strife, terrorist activity, industrial dispute, disease, industrial or nuclear disaster, adverse weather conditions, fire and strikes. Escape Trekking Adventures and or its third party reserve the right either before or during the course of the tour to refuse to carry or accommodate any client which it reasonably considers, in the light of the best interests of all participants within the tour group and crew, to be unsuitable by reason of physical or mental condition or unruly behavior. 10. Cancelation due to small tour numbers. Escape Trekking Adventures reserves the right to cancel any tour prior to departure in the event that there are too few people booked on a tour in which case you will be given a full refund of the tour price paid by you. You will not be entitled to claim any additional amounts or seek any compensation for any injury, loss, expenses or damage (either direct or consequential) or for any loss of time or inconvenience which may result from such cancellation (including but not limited to visa, passport and vaccination charges, or departure, gear purchases, airport and airline taxes). We require a minimum of 6 trekkers in a selected trek. If numbers fall to 6 or below, we reserve the right to cancel, or change dates of the trek or refer you to another existing trek. Trek numbers are regularly reviewed and we will notify you of any cancelations no later than 50 days prior to your selected trek. If numbers for your selected trek decrease below 6 people, you may be required to pay a small group trekking fee should you wish to proceed with the tour. A $4-600 fee per person is required to be paid. This does not happen very often, so if you have any questions regarding this just ask. 11. Itineraries and brochures. Itineraries and other details are published in good faith as statements of intention only and reasonable changes in the itinerary and related items may be made where deemed necessary or advisable by Escape Trekking Adventures. The information contained in Escape Trekking Adventures brochures, itineraries, and internet site is, to the best of Escape Trekking Adventures belief, correct at the date of publishing. Postpone, cancel or delay (either in relation to the departure or arrival times or the duration of the tour) any such aspect of the tour if, in the absolute discretion of Escape Trekking Adventures, it is necessary to do so due to inclement weather, snow or icy conditions or conditions that are otherwise likely to be hazardous or dangerous or due to any other adverse or threatening conditions whether political or military or terrorist or otherwise or if, in the absolute discretion of Escape Trekking Adventures, there is a likelihood of any such event occurring which may impact upon the safety of the participants, or if an act or omission of a third party prevents the tour or the aspect of the tour being undertaken in accordance with your booking or for any other reason considered necessary by Escape Trekking Adventures. In the event of any change, modification, cancellation postponement or delay under this condition, you acknowledge that you will have no right of refund of the tour price (whether in whole or in part) and no right to claim compensation for any injury, loss or damage or other additional expenses incurred by virtue of the change, modification, cancellation postponement or delay. Escape Trekking Adventures also reserves, in its absolute discretion, the right to cancel any tour due to any government travel warning or advice, or any change in such warning or advice. In this event, condition 4 applies as if you had transferred or cancelled the tour at the date that Escape Trekking Adventures cancelled the tour due to the governmental travel warning or advice. Travel insurance may compensate you depending on the circumstances. 13. Tour Prices. Package prices are per person based on ground costs, fuel prices, airfares, exchange rates and assumptions made at the time of printing the brochure. Escape Trekking Adventures tries its utmost not to increase tour prices, however sometimes increases are outside its control. 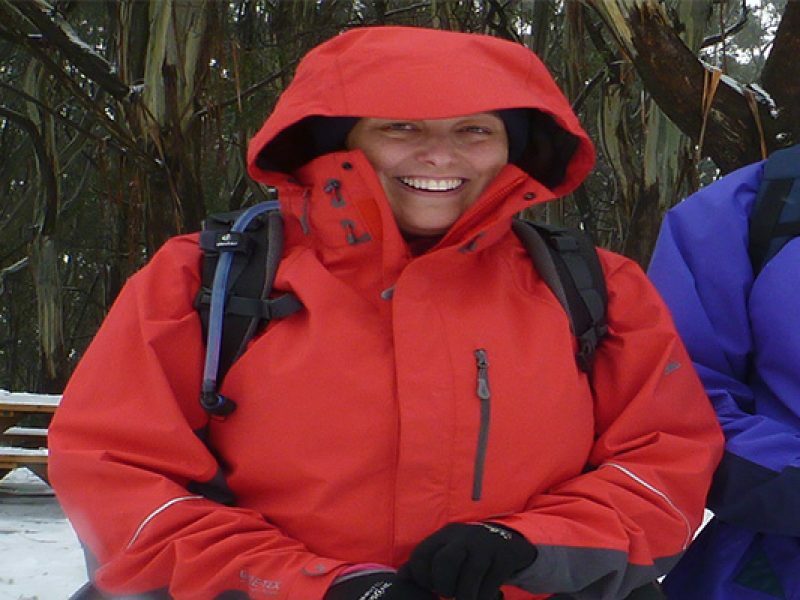 The most current prices will be listed at www.escapetrekkingadventures.com.au so visit the website before booking. Escape Trekking Adventures reserves the right to amend tour prices without notice at any time before and including the departure date. Amendments may be necessitated for many reasons including, but not limited to, exchange rate fluctuations, increased fuel costs, airfares, airport charges, increases in ground operator service fees, or the need to engage alternative air or ground operators. Any increase in tour prices must be paid prior to the departure date. 14. Proof of citizenship or information required to travel. It is your responsibility to obtain proper identification or proof of citizenship as required by the authorities of the destination to which you are travelling. You will not be entitled to a refund if you are denied boarding or entry on any basis, including without limitation, improper documentation or failure to provide information. It is recommended that your passport is valid for six months beyond the date of your return home to your home country. 15. Airlines and other transport providers. Any material published by Escape Trekking Adventures, the Booking Form and these conditions of contract are not issued on behalf of, and do not commit any airline whose services are used or proposed to be used in the course of the tour. In the event that an airline’s proposed travel or fare schedule is amended or cancelled, such amendment or cancellation will not be considered a cancellation of the tour by Escape Trekking Adventures. Any flights or other transport forming part of the tour arrangements are subject to the conditions of the carrying airline or other transport entity, which in most cases limits the airlines’ or other transport entity’s. You have submitted your booking for the tour after giving due consideration of relevant travel information including, without limitation, any relevant information or advice given by the governments of Australia, New Zealand and Canada, the British Foreign Office and US Department of State and that it is your responsibility to acquaint yourself that information or advice. For the above reasons you therefore accept the inherent and increased dangers and risks associated with the proposed adventure tour and the accompanying risk of injury, death or property damage or loss. You may not rely on any representations concerning the tour made by Escape Trekking Adventures, which are not contained in these conditions. In connection with any optional activities which you may undertake during the course of your tour but which do not comprise part of your tour itinerary and you accept that any assistance given to you by Escape Trekking Adventures representatives in arranging such optional activities will not render the Escape Trekking Adventures representatives liable to you in any way. 20. Australian Consumer Law Under the Australian Consumer Law, statutory guarantees apply to the supply of recreational services of the kind offered by these terms and conditions. “Recreational services” is defined as including activities that involve a significant degree of physical exertion or risk undertaken for the purposes of recreation, enjoyment or leisure. These guarantees mean that Escape Trekking Adventures, as the supplier, is required to ensure that the recreational services it supplies to you are rendered with due care and skill and are fit for their intended purpose. Under the Australian Consumer Law, Escape Trekking Adventures, as supplier, is entitled to ask you to agree that these statutory guarantees will not apply to you. If you sign this form you will be agreeing that your rights under this agreement, if you are killed or injured because the services provided were not rendered in accordance with these statutory guarantees, are excluded, restricted or modified in the way set out in this condition. To the extent permitted by law, you hereby exclude, release and forever discharge all Escape Trekking Adventures representatives from all liability for any and all claims, loss, damage, cost or expense arising from your death or your suffering physical or mental injury or any other condition, occurrence, activity, form of behaviour, course of conduct or state of affairs as specified in section 139A of the Competition and Consumer Act 2010 (except in the case of liability arising from the reckless conduct on the part of the Escape Trekking Adventures representatives) and connected with your participation in the recreational services which comprise the tour. The non-refundable $700 Deposit secures your place in the trek, and No bookings will be made until the deposit is paid. This may result in missing the opportunity to be involved, so we suggest you book early. Once your deposit is paid, your trek place & price is secure. Balance is due 8 weeks prior to your selected trek. Quotes are valid for 30 Days, after which we reserve the right to increase costs. Note: Only due to changes beyond our control, such as the exchange rate between Australia and our international destinations /or unexpected increases in outsource services/ costs (charter, accommodation, transport, fees etc) and/or review of trek package and prices, will prices be increased. If you need to have your quote reviewed please contact us. Prior to 60 days departure if you select to cancel your trek you loose 100% of the $700 deposit. Between 29 & 59 days prior to your selected trek, a $1600 cancelation fee applies (per trekker). Between 28 & 1 days prior to your selected trek, a $2800 cancelation fee applies (per trekker). (We can assist with travel insurance claim). Please note the above is a guide and maybe dependent on what has been booked for your participation in the trek itinerary – So Cancelation fee may increase to cover these costs. The cancelation fee is in addition to the $700 deposit. Should you require canceling your trek as mentioned above – You are able to keep your ETA polo etc. that has been sent to you. – Should you need to cancel your trek, remaining balance can be transferred to another trek less your cancelation fee. At Escape Trekking Adventures we pride ourselves on offering SAFE, professional treks, led by experienced guides and friendly service, so if you have any questions please feel free to Contact Us. Please read carefully these terms and conditions of contract. If you wish to transfer from one tour to another, you must notify Escape Trekking Adventures in writing. Once Escape Trekking Adventures receives your notice the transfer will take effect subject to the following. Transfers may only be made to another tour to commence within 12 months of your original departure date and the following transfer charges will apply: • If your notice is received more than 70 days prior to your original departure date a $100 transfer fee will apply. In addition, any increase in airfares or operational services will be payable by you: or • If your notice is received within 70 days prior to your original departure date up to 50% of your original tour price will be forfeited provided your notice is received at least 35 days prior to your original date. Additional charges will be applied to you if you add, adjust or change a service prior to, during or before the completion of a trek. The cost of these will be charged out at the full rate and may incur a surcharge fee of $80 to cover any additional logistic arrangements that may be required for this service. Examples of this service could be but not limited to change from twin share to single share accommodation, use of (additional) personal porter, excess luggage, room upgrade or airport transfer out side the itinerary. If any part of a condition is illegal, unenforceable or invalid, it is to be treated as removed from the conditions, however, the remainder of the conditions are not altered. SAFETY, SAFETY, SAFETY is the number one reason that sets us above our competition. We have developed a safer acclimatisation program that works. Many Australians trek to EBC and many fail due to inflexible programs with no contingency for weather delays (extremely common at any time of the year) or persons within the group not acclimatising well or becoming sick with tummy upsets thus exposing them to risk of HACE, HAPE or AMS all altitude related illnesses. We carry out oxi pulse symmetry readings daily, carry altitude sickness score cards, oxygen and other first aid equipment to deal with unforeseen illness. 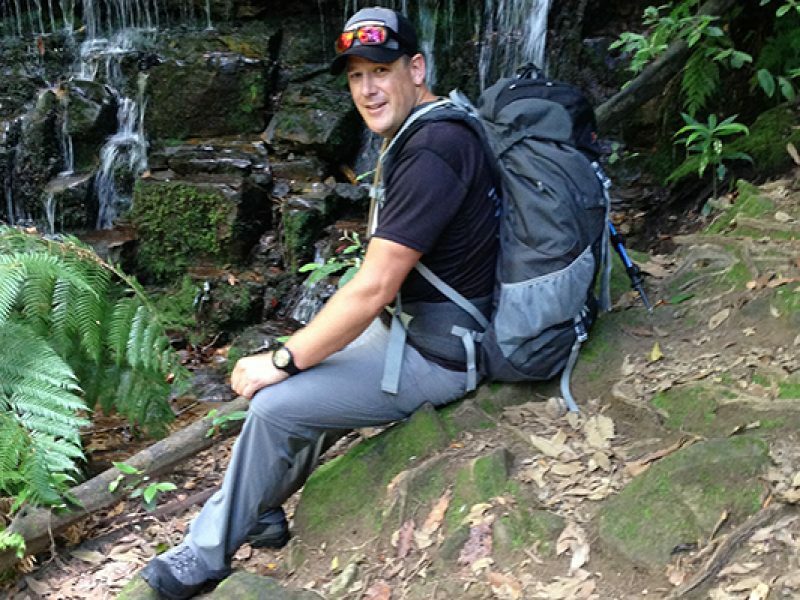 Shane leads our Australian led treks and has loads of experience in trekking and alpine environments. Escape Trekking Adventures is a qualified professional outdoor recreation business. We are not a travel agent selling trips to adventurous locations with no qualifications or little knowledge of the Australian Adventure Activity standards (the standards that are the minimum requirement for outdoor activities in Australia). Developing nations do yet have such high standards or regulation in the adventure industry and many operators can hide behind this lack of governance but not us we ensure we operate as if in Australia. Escape Trekking Adventures not only has a high quality quantitive risk assessment for each destination that we travel but we also have the health safety management systems that underpin the risk assessments with safe operating procedures, systems for in the field risk assessments (the environment is dynamic and can change with out warning), codes of conduct and industry best training packages for leaders and porters. This is reflected in our outstanding safety record. 1. COMMUNICATIONS: Our Everest Base Camp tours carry satellite phones with head guides to ensure we can remain connected with the outside world, this was highlighted in the 2015 Nepal earthquakes where this left many operators exposed with no communications to arrange an emergency extraction for the crew and clients. Many loved ones around the world appreciated communications that informed them their families and friends where safe. 2. MEDICAL: Your safety is our business and paramount, we take it seriously and so many of our Guides and Trek Leaders have qualifications in Advanced Wilderness First Aid (AWFA) and Remote Area. We carry a comprehensive team First Aid kit on all our treks. 3. QUALIFIED & EXPERIENCED: We are a professional outdoor adventure recreation business, we are not ill informed travel agents who sell holidays, we are not ill trained, ill equipped or unqualified to run outdoor adventure activities. We are licensed to carry out these types of activities in Australia and off shore. Our Australian Trek Leaders come from diverse backgrounds some are Adventure Activity Leaders others ex Military and have travelled the globe. They all trekked the Ecerest Base Camp and other high altitude locations. Our guides are there to provide life-changing experiences to you our clients. Our local employees and guides are hand picked, trained and groomed in to the best employees in the business. We recognize our teams are our greatest assets and we look after them to ensure they hang around and we have the best crews on the ground. 4. CATERING: All your meals are supplied on our trekking component of our tours with limitations on the amount of food and water or restrictions of what you can order. Please be careful of this as your food will cost up to or in excess or US$810 much more than the $2-300 that you can be advised of. We also ensure all of our porters and guides are fully feed with 3 meals a day to ensure they have the correct nutrition to stay in advance of the group with your belongings locked in your room when you arrive to the lodge at the conclusion of the day. 5. INSURED: We have full Public liability insurance and we are a licenced Tour Operator. 6. LOGISTICS: Once you arrive at your destination for your trek and your needs are tended to and co-ordinated and controlled by one of the most experienced local Operations Manager in the business who is a permanent ETA in-country staff member. 7. ITINERARIES that actually work: We don’t just follow the crowd rushing our clients through fast paced programs. Shane decided at additional costs incurred we would add additional days to our tours to give our clients the best chance at success in high altitude environments. 8. HOLISTIC HISTORICAL JOURNEYS: Our tours will uncover the achievements of MT. Everest past, it’s horrors and amazing journeys of this amazing mountain. This is not just a walk for us we provide relevant and historically correct information to the region and mountaineering history of the area.All of our tours include cultural insights and local history told by our english speaking guides. 9. 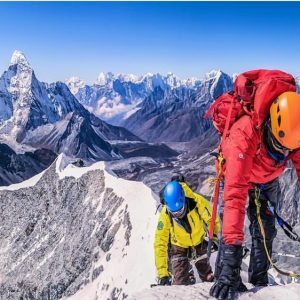 NOT JUST GUIDES BUT MOUNTAINEERS: Mountaineers know mountains and techniques of mountaineering to be able to provide you insight to this fascinating world. 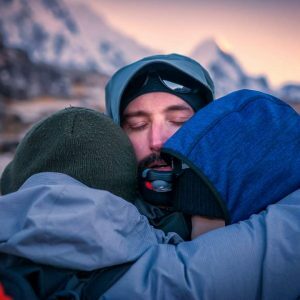 Shane will actually set up demonstrations of expedition fixed line ascents and glacier travel (icefall) techniques in a safe environment away from rock and ice so you can get a hands on feel for the mountaineering styles in the region. 10. PRICE: Value for money, you will find ETA one of the most affordable tour operators and our small groups means quality. We offer a niche market to those who wish to have their adventures taken care of by Australian and Nepali guides. Care and Quality are our objectives. Escape Trekking Adventures primarily operates Australian guided tours in Nepal. This is for a variety of reasons, our guides are highly skilled, pay the correct attention to the cultural and historical aspects of this tour, can handle medical emergencies better than your run of the mill tour operator and most of all being Australian we know what Australians like in their adventure holiday. Escape trekking Adventures has hand pick our all of our guides and consider them the cream of the crop so to speak. Our guides are trained, assessed and deemed competent as a high altitude tour guides. Our job description for Everest Base Camp tours are dynamic. Recognising this, we ensure we are your cultural interpreter, local historian, your tour manager (this goes beyond the walk and begins from the time you book and includes the entire duration of the tour in Nepal until you are back home safe in Australia), we are your environmental guide, we are you medical consultant and field medical attendant and most of all are your friend when you need some one to talk to, laugh with and cry with. We come from different backgrounds but we are all highly trained and competent in outdoor wilderness environments. This is something that flows down from our planning and preparation for each tour we host and our experience in various locations. Wanting to know more about our guides, visit our teams profiles for individual guides. If you are looking at trekking to Nepal’s Everest base Camp it is essential that good health and preparation with regard to your health is the first and foremost task. As with all adventure travel outside of your usual environment you will need to be prepared for the activity. The required immunisations for every destination around the world could change on a daily basis and as a result you will be required to check with your Doctor what you should be protected against. This is a viral disease of the liver which is transmitted through eating contaminated food or drinking contaminated water. it is the most common vaccine preventable disease that occurs in travellers to less developed areas of the world. It is strongly recommended for travel to Nepal. This is a viral disease of the liver that is transmitted via blood, blood products or bodily fluids. It is vaccine preventable and now part of the childhood immunisation schedule. Many adults may have missed this important vaccine and travel is a good reason to get up-to-date. Typhoid Fever is caused by a bacteria found in contaminated food and water. It is endemic in the developing world and vaccination is recommended for travellers to areas where environmental sanitation and personal hygiene may be poor. The adventuous eater venturing “off the beaten track” should consider vaccination. Tetanus is caused by a toxin released by a common dust or soil bacteria which enters the body through a wound. Diphtheria is a bacterial infection of the throat and occasionally the skin. It is found world wide and is transmitted from person-to-person by coughing and sneezing. Whooping Cough (Pertussis) is a highly infectuous respiratory infection responsible for 300,000 deaths annually, mainly in children. Because many adults no longer have immunity from childhood immunisation it is advised that travellers to less developed countries have a tetanus, dihtheria and pertussis booster. Childhood immunisation coverage in many developing countries is not good. As such, travellers under the age of 40 years should have their MMR immunisation completed. Those over the age of 40 years are most likely to have long term immunity from previuos exposure as a child. This very comon infectious disease can now be prevented through immunisation. Many people miss the disease in childhood only to have a significant illness as an adult. If you do not have history of immunisation, a simple blood test can show whether you are at risk. Individuals intending to travel out of an Australian winter might consider the current flu vaccine at the beginning of the season. exposure to illness in airports and commuter transport is common and exposure may ruin a much needed break. Cholera is a severe, infectious diarrhoeal disease common in developing countries. It is associated with conditions of pverty and poor sanitation. It causes a sudden onset of extremely profuse, watery diarrhoea within one or two days after contact with the bacteria. Rapid dehydration can occur. Travellers who follow guidelines for eating and drinking safely will minimise the risk of contracting cholera. An oral vaccine is now available. All travellers to Nepal should consider vaccination against polio. Polio is a viral infection that can lead to paralysis and sometimes death. Transmission is by faecal contamination of food, usually by unhygienic food handlers or flies, or directly from infected nasal secretions. Although most Australian’s and New Zealanders will have been immunised in childhood, it is important to note that efficacy wanes after 10 years and a booster dose is recommended. Malaria is transmitted by a night biting mosquito. Medications to reduce the risk of the disease are not generally recommended but any illness which is flu-like in nature after returning should still be checked for malaria. Meningitis is an inflammation of the membrane overlaying the brain. It can be caused by bacteria, a virus or a fungus. Bacteria meningitis is the form of most concern to travellers. It is a serious disease and can rapidly become life threatening. It is transmitted from person-to-person through close contact (the same way you catch a cold). Vaccination might be considered for those backpacking off the beaten path or those working in health areas where crowded conditions occur. The tea house accommodation in most of the treks in Nepal is conducive to the spread of meningitis and epidemics occur sporadically. JE is a mosquito borne viral disease prevalent in rural areas of Asia that can lead to serious brain infection in humans. Risk is usually greatest during the monsoon months. A vaccine is available and is particularly recommended for adults and children over 12 months of ago who will be spending a month or more in rice growing areas of countries at risk. Insect avoidance should be considered the primary means of defence. The risk is higher in the southern lowlands bordering India (Terrai). Rabies is a deadly viral infection of the brain transmitted to humans. The disease itself is rare in travellers, but the risk increases with extended travel and the likelihood of animal contact. The best way to avoid rabies is to avoid all contact with animals. Dogs are the main carriers; however monkeys, bats, cats and other animals may also transmit the disease. Pre-exposure vaccination is recommended for extended travel adn those who work with or are likely to come into contact with animals. Up to 40% of tourists may develop diarrhoea wihtin the first week of travel. A variety of germs can be responsible and a Traveller’s Medical Kit containing appropriate therapy can rapidly improve the symptoms. It is also important to follow the rules of healthy eating and drinking to minimise risks. Everest Base Camp is an amazing adventures but prior to the trip you can feel a little under prepared for your journey and wish to seek a little advice. The below videos are intended to take away some of the confusion so that you are better prepared. First Aid Kits & what they should contain. When trekking in Remote area’s you should always be mindful of what items you may require to treat any aliments that may occur finding it difficult to purchase any such items. Everest Base Camp treks (and Nepal lodge trekking in general) you can buy some supplies but these are mainly limited to the large Sherpa villages so it is best to carry the right things with you. If you suffer from heyfever, sinus, reflux or any such medical condition you should bring medication to treat this, plan for the worst case scenario and be prepared. Anti-inflammatory tablets and gel (as prescribed by your doctor, remember voltaren and the like take up to 48 hours to relive symptoms so a fast acting tablet such as ibuprofen is great to start with), antibiotics for treating diarrhoea (as prescribed by your doctor), gastro stop, antibacterial gel, betadine liquid (Betadine can also treat your water for purification as a emergency back up if required), blister packs, one roll of broad elasticated bandage, roll of strapping tape, antihistamines, anti sickness tablets, painkillers such as Panadol Forte/Aspirin tablets/capsules, Codral cold and flu tablets, sunscreen, pawpaw cream along with one pack of a general use antibiotics. The following video explains how to separate your gear into different packs of various sizes and colours. I personally try to use one colour dry bag for each category I separate the items into, allowing the item you are looking for to be easily identified. You should try to group things into to medications, toiletries, clothing, sleeping gear, general use items, spare batteries, dirty or wet clothing, first aid kit and snacks in to several separate bags for identification. Avoid using one large dry bag as this means the entire contents will need removal to find the item you are looking for as well when you pack your bag it will need to be inside the backpack to fit the gear in correctly. Trust me I have been through all of these issue in the past. 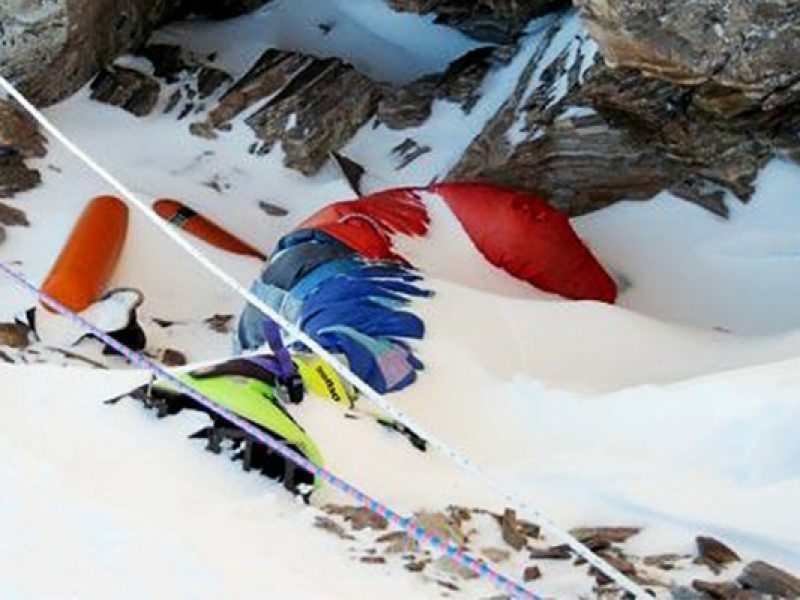 This video will walk you through the items you require to trek in cold climates at altitude. Simply using ski field clothing will not suffice and will be very uncomfortable whilst trekking, you will require items to keep you warm and safe. Being cold at altitude can lead to altitude sickness such as AMS, HACE and HAPE. Layers is still the best clothing configuration for these treks and surprisingly enough you will require lightweight items that breath, high altitude trekking be quite warm during the day one minute to freezing cold blistering winds the next, so you will need to be able to regulate your core temperature according.